As a strong cold front oriented southwest-to-northeast slides into the eastern states on Tuesday, low pressure is likely to form in the southern states. Precipitation is likely to break out early tomorrow either as snow or a mixed bag in the DC-to-Philly-to-NYC corridor and then it could change to rain for brief time before changing back to all snow. The timing of the changeover back to all snow is 2-4 PM across DC, 4-6 PM in Philly and 6-8 PM in the NYC metro region and this is when the precipitation should get steadier and heavier. Roads are likely to become slick at the time of the changeover as temperatures drop to freezing or below and snow begins to accumulate. Preliminary estimates for snowfall accumulations are on the order of 1-3 inches in the immediate DC, Philly, and NYC metro regions with the higher amounts in that range to the north and west and lower amounts to the south and east. 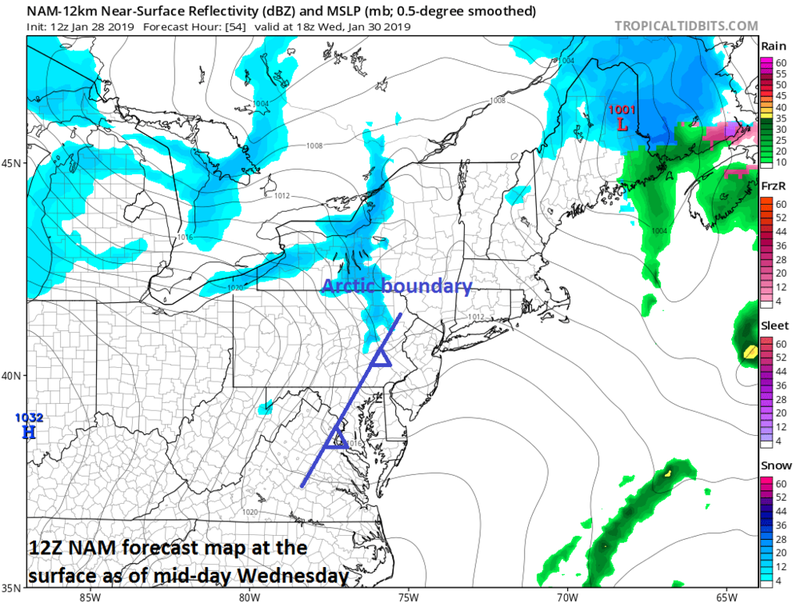 The true Arctic frontal boundary will slide through on Wednesday and it could be an active frontal passage. Winds are likely to gust to 40 mph or so as the front arrives and there can be snow showers in the I-95 corridor. There is even an outside chance for a heavier snow squall or two when front arrives mid-day to mid-afternoon on Wednesday which could cause a quick small additional accumulation. The full brunt of the Arctic blast for the I-95 corridor will arrive on Wednesday night. Temperatures will plunge to near the zero degree mark in many suburban locations by early Thursday and the winds will make for painfully cold wind chill values. On Thursday, temperatures will have a hard time even reaching the teens in much of the I-95 corridor region; especially, north of the PA/MD border and the winds will continue to be noticeable. Looking ahead, there may be another system to deal with at the end of the work week and it would certainly remain cold enough for snow. Temperatures on Friday will be well below-normal and still on the cold side as we begin the weekend. After that, there are signs for a noticeable warm up at the beginning of next week and temperatures could rebound into the 40’s and 50’s along the I-95 corridor. International Falls, Minnesota dropped to -44 degrees (F) on Sunday morning…its 5th lowest temperature ever. An all-time record low of -49 degrees (F) took place this morning in Ontario Canada (Chapleau). The all-time record low at Chicago, Illinois is -27 degrees (F) set on January 20, 1985 and that record is in jeopardy as temperatures could get down to those levels by early Wednesday (and perhaps again early Thursday)….wow!.